Vancouver is consistently ranked as one of the most beautiful cities in the world so it’s no surprise over 800,000 cruise passengers come through the Port of Vancouver each year, extending their stays before or after their cruise to enjoy this naturally stunning west coast destination. For more than 30 years, we’ve been a leading homeport for Alaska cruises and act as the home base for one-way and round-trip cruises through the scenic Inside Passage, a stunning coastal route that runs along the west coast of British Columbia. More information to help you plan your trip can be found in cruise schedule and tourism resources. You can also download the Port of Vancouver eHub app for insight into peak volume times, vessels in port, and transit and hotel maps. Why choose a Vancouver-based cruise? Vancouver offers travelers a vibrant destination like no other to enjoy either before or after your cruise. From the stunning west coast mountains, wildlife and shorelines to the international cuisine, festivals, exciting nightlife and famous attractions like the Capilano Suspension Bridge, Stanley Park, Grouse Mountain, and FlyOver Canada at Canada Place, Vancouver will ensure a trip you won’t forget. Vancouver is the only homeport with both one-way and round-trip itineraries to Alaska through Canada’s spectacular Inside Passage. Not only will you experience the glaciers, mountains, wildlife and culture of America’s last frontier, the Inside Passage route allows you to experience some of the most scenic coastline British Columbia has to offer. The shorter distance travelled through this route also means you are able to spend more time enjoying your stops in Alaska. As the only homeport offering one-way trips, sailing out of Vancouver offers you a unique experience and exciting itineraries. In addition to Alaska, travelers can also enjoy exciting voyages to Hawaii, the Panama Canal, Asia, the South Pacific and California all through the Canada Place cruise terminal. Canada Place is a national icon as well as an award winning cruise terminal. Our facility offers passengers convenient services and a safe and efficient passenger experience. Our world-class cruise terminal has recently been recognized with three prestigious awards including Best Turnaround Destination, Most Efficient Port Facilities and Most Efficient Terminal Operation. 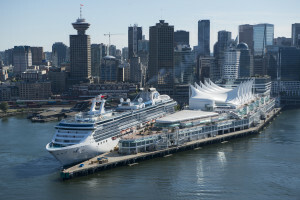 The Canada Place cruise terminal is conveniently located in downtown Vancouver in close proximity to entertainment, restaurants, shopping and attractions, and is only 30 minutes from the Vancouver International Airport (YVR). Public transportation, taxi service, shuttles, limousines and long and short-term parking are available for passengers. Visit passenger information, directions and transportation for additional information. Our port lies in a naturally beautiful harbour setting and we work hard to keep it that way with programs like shore power, an initiative that aims to decrease marine diesel air emissions by allowing cruise ships to shut down their engines when in port. The Canada Place cruise terminal is equipped with Shore Power on its east and west berths. Our Blue Circle Awards recognize ships that participate in our EcoAction program, which promotes emissions reduction goals for ocean-going vessels, including cruise ships. More information on these programs is available in environment.